Want to make boring old colorless water brighten up on command? Well, you can control the color of water with this little magic trick. Actually, it's not really magic, but a classic science experiment known commonly as the iodine clock reaction, which uses the reactions between water and chemicals to instantly colorize water, seemingly by command. You can use different colorless chemicals to produce different colors, and you can even make the color vanish to make the water clear again. So how does it work? The first solution is composed of hydrogen peroxide and sulfuric acid, and the second beaker has a mix of potassium iodide, sodium thiosulfate, and starch. Now, when iodine and starch react, they produce a dark blue color, but the potassium in the second solution keeps them from reacting. When both solutions are mixed together, the sulfuric acid strips away the potassium and causes the iodine to react with the hydrogen peroxide. This creates a triiodide that will react with starch, but the sodium thiosulfate uses the triiodide before that can happen, which is what causes the delay. Eventually, the sodium thiosulfate can't use all the triiodide, and it is finally able to react with the starch. The color change is pretty much instant once this happens. 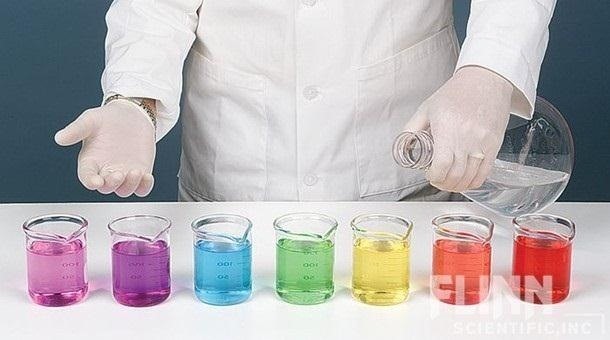 Above, the first color-forming mixture is composed of sodium metabisulfite, ethanol, sulfuric acid, and potassium iodate. If you can get your hands on those chemicals and a couple of beakers, you can easily recreate this experiment at home, but it may take a few tries to get the timing right. As far as safety goes, throw on some goggles, a pair of gloves, and don't drink anything and you should be golden. The iodine will stain skin and fabric, though, so you might also want to put down some plastic before you start. Beaker 1: Mix 50 mL of Solution A with 50 mL of distilled water, then add 10 mL of Solution C.
Beaker 2: Add 50 mL of distilled water to 50 mL of Solution B. Now, just pour the solutions in the beakers back and forth for about 10 seconds and the solution will suddenly turn super dark, almost black. For more details, check out Steve Spangler's full tutorial. You can also buy his kit that includes everything you need to make an awesome rainbow-colored Iodine Clock Reaction here. A simpler version of this experiment uses iodine, hydrogen peroxide, and a Vitamin C tablet that you can find in any drugstore. Head over to Science Bob for instructions. Hello, this is an interesting reaction, yet I wonder how one can reverse it? Does anyone know if and how this would be possible :)?